Puff pastry is pre-made flaky pastry dough that you can cut into pieces to form into mini-shells for appetizers or desserts. Making the pastry into shells lets you create individual delicacies that are easy to both serve and eat. The pastry dough is given its light and flaky texture when layers of shortening and dough are rolled out until the dough reaches the desired thickness. Sold frozen, the dough is ready to bake once you thaw and form it into a shell shape. Remove the pastry sheets from the freezer and place them in the refrigerator to thaw for about four hours. Set the oven rack in the lower half of the oven. Separate one pastry sheet from the stack and place it on a lightly floured counter or rolling board. Cut the pastry into 2-inch squares or a size that fits into the muffin tin you are using. 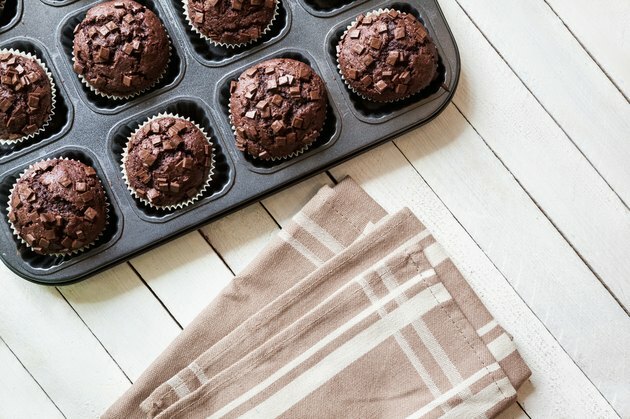 Cut 1-inch squares if using a mini-muffin tin. Use a round cookie cutter if you want a perfectly shaped shell. Spray the muffin pan with cooking spray to prevent sticking. Place a pastry puff square or round over the muffin hole and gently press it into the space without flattening its puffy texture. Repeat for every muffin hole in the pan. Poke the bottom of each shell with a fork two or three times to prevent the dough from rising as it bakes. Mold the top edges of the shells into a fluted design by pressing the dough edges with your pointer finger and thumb around its circumference. Place the muffin pan into the middle of the oven and bake for about 20 minutes. Check on the shells after 10 minutes, and watch them closely for the last 10 minutes to prevent burning. Remove the shells when they are golden brown in color. Remove the shells from the pan by gently lifting them with a fork. Place them on a cooling rack to cool before filling and serving. You can also use your favorite puff pastry recipe for the pastry shells instead of purchasing premade dough. Avoid overworking the dough to keep it light and fluffy and chill the dough in a refrigerator for four to six hours before following the steps to cut the pieces and form the shells in a muffin pan. Avoid pressing the pastry puff firmly into the muffin cups to keep the finished product light and fluffy. Roll the puff pastry to a 1/4-inch thickness if you want a thin and crispy shell instead of a fluffy shell. Fill the shells just prior to serving to prevent them from getting soggy.